India’s 1.2 billion citizens use around 15 percent of the world’s supply of palm oil every year. Previously, the Indian market has not been stringent about making sure their imports were sustainably produced. But the past 18 months have seen an uptick in sustainability certifications. Note: a shortened version of this article first appeared in The Guardian. In a food stall on a dusty New Delhi street corner, a woman in a bright orange sari drops several samosas into a skillet of bubbling liquid. It crackles and pops as it laps up their potato-filled dough. Like the vast majority of the Indian population, she is cooking with palm oil, that contentious vegetable substance increasingly met with controversy in the West. In India, however, it’s largely an unquestioned daily essential: cheap, readily available, and perfect for cooking all the curries on the subcontinent. India is the world’s top importer of palm oil, with its 1.2 billion citizens gobbling up approximately 15 percent of the world’s supply. The vast majority—95 percent according to WWF—is used in India as edible oil, with the remainder added to chemical compounds in hair-care and beauty products. Palm oil is made by pressing the fruit of oil palm trees. Photo by Rhett A. Butler. To meet the edible oil demand of its growing population, India imports nearly all of its palm oil. Over two-thirds is sourced from Indonesia, where the resulting deforestation, C02 emissions and biodiversity losses remain major concerns despite zero-deforestation commitments. 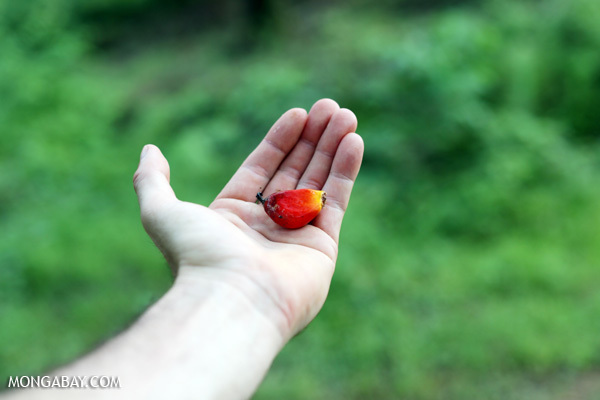 If farmed sustainably (i.e., with minimal social and environmental impacts), palm oil has great potential as an efficient crop. It yields more oil per hectare than any other oilseed and needs less water, fertilizer and pesticides than other monoculture crops. At present, however, the volumes of certified sustainable palm oil flowing into the country are minimal, making India a top contributor to the harmful social, environmental and ecological effects associated with the crop. Nandikesh Sivalingam, a senior campaigner at Greenpeace India, believes there is scope for change: “Indian companies have the power to pressure their Indonesian suppliers towards sustainability,” he says, adding consumer outcry in the EU and U.S. over palm oil-related deforestation was an important driver in bringing about global sustainability commitments. “We know that our primary customers are not concerned about deforestation,” Prabianto Mukti Wibowo, Assistant Deputy Minister for forestry in the Economic Affairs Ministry of Indonesia admitted at a World Bank conference on land and poverty held in Washington in March. Yet, the Indian market has been largely content to stay as it is. Certified sustainable palm oil comes with a higher price tag due to low demand in the present market, and neither the government nor taxpayer seem likely to foot the additional cost. As a foodstuff, palm oil reaches into all pockets of Indian society, from noodles to fried snacks, accounting for 65% of the country’s demand for edible oils. In a country where over 21% of the population lives below the poverty limit, a slight price increase has the ability to affect citizens’ livelihoods. The government has seemingly little incentive to absorb the surplus cost, which would quickly add up given the large volumes flowing in. India imported 8.85 metric tons of palm oil in 2014-15. Unlike the boycotts and general consumer outrage grabbing headlines in Europe and the U.S., consumer awareness and interest in sustainably sourced palm oil remains zero to none, giving the domestic market little pressure to move towards sustainable practices, according to sources interviewed. 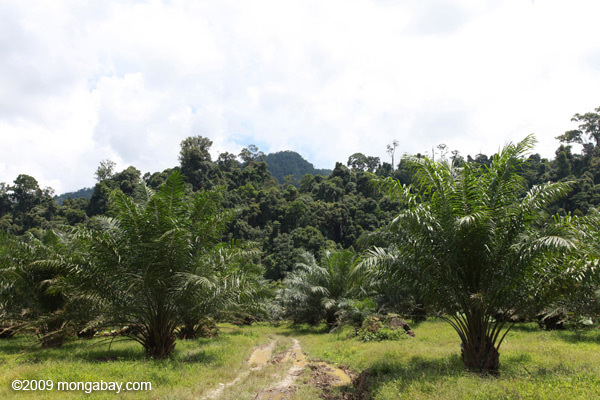 “There is no real ‘burning platform’ for companies to decide to move towards certification, especially for products aimed at the internal market,” Savi said, highlighting a main challenge for the RSPO in pushing forward certified sustainable palm oil. 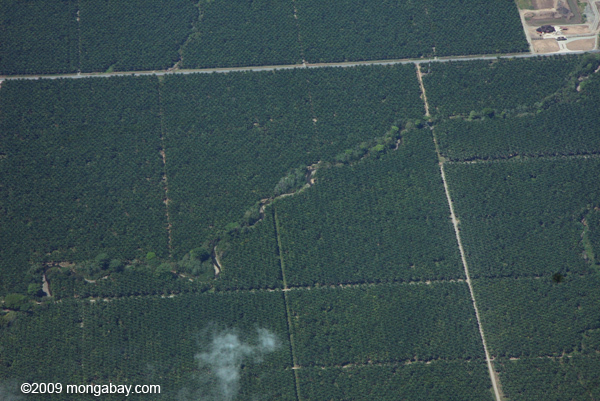 An oil palm plantation sits adjacent to Gunung Leuser National Park in Sumatra, Indonesia. Photo by Rhett A. Butler. However, a glimmer of hope for sustainable palm oil may be hovering over the subcontinent. The past year and a half has seen an uptick in RSPO sustainability certifications and business-to-business knowledge sharing, according to industry insiders. 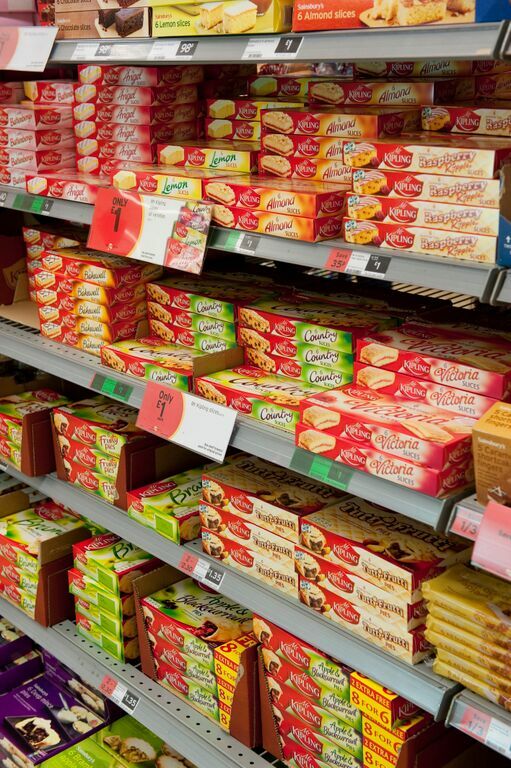 “Certain companies have made commitments to sustainable palm oil, in particular the FMCG multinationals,” said Philip Tapsall, Director of Sustainable Business at World Wildlife Fund India, an RSPO member. “We are starting to see these commitments extend to the Indian market.” FMCGs, or Fast Moving Consumer Goods companies include Unilever, and Johnson & Johnson, among others. Some of the large refining and trading companies that make up the Indian market are members of FMCG’s supply chains. The latter’s sustainability commitments, including zero-deforestation pledges, have had trickle-down effects in the Indian market. “Global procurement policies from multinational companies demanding certified sustainable products are definitely having an impact in driving change locally,” Savi said. Tapsall cites Hindustan Unilever as one of the primary drivers of sustainability policy to Indian suppliers. The company’s Sustainable Living Plan, which includes a goal to have all palm oil come from traceable sources certified as sustainable by 2020 requires Indian members of the companies supply chain to get on board. “Such global commitments have a trickle down effect onto the Indian market,” Tapsall said. “And we’ve seen a spate of RSPO certifications in the last two years.” India currently has 44 RSPO members, up from just four in 2011, suggesting interest in sustainable palm oil is picking up. Galaxy Surfactants Ltd., an Indian company that supplies Hindustan Unilever among others, was one of first Indian refineries to be RSPO certified. The RSPO lauded the move as “a significant milestone,” similar to moves made by companies in other overseas markets. 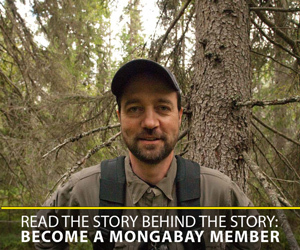 The mass balance method allows certified sustainable palm oil to be mixed with equal parts non-certified palm oil. While not yet reaching the ideal of supplying 100 percent segregated sustainable certified palm oil, the move is a step up from RSPO-supported GreenPalm certificates—pieces of paper, not physical oil, that can be bought by anyone,—which previously dominated the sustainable palm oil market in India. While most palm oil is produced in Indonesia and Malaysia, plantations are popping up around the world, such as this one in Costa Rica. Photo by Rhett A. Butler. International clients like Johnson & Johnson and Unilever account for 60 percent of the company’s revenue, with the rest in the domestic market, according to Sriganesh. Yet the company has decided to apply certification standards to both the domestic and import markets and hopes other Indian companies will follow suit, creating a larger market for certified sustainable palm oil.